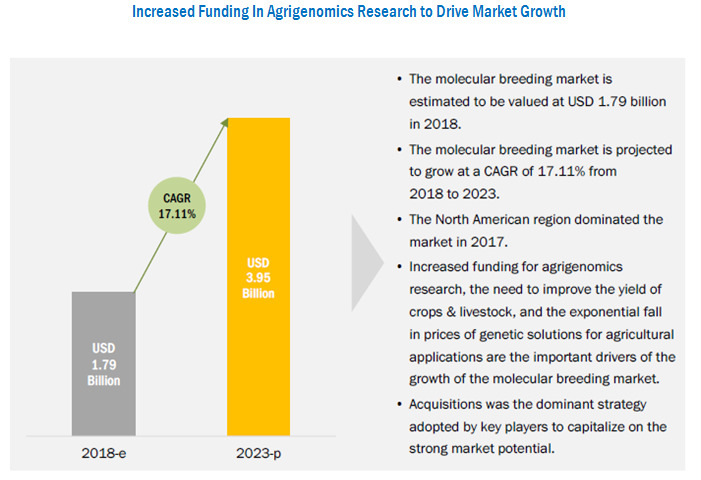 [155 Pages Report] The molecular breeding market was valued at USD 1.57 billion in 2017 and is projected to reach USD 3.95 billion by 2023, at a CAGR of 17.11% during the forecast period. Major regions were identified, along with countries contributing the maximum share. Secondary research was conducted to obtain the value of the molecular breeding market for regions such as North America, Europe, Asia Pacific, and RoW. Key players have been identified through secondary sources such as the Bloomberg Businessweek, Factiva, agrigenomic magazines, and companies’ annual reports while their market share in the respective regions has been determined through both, primary and secondary research. 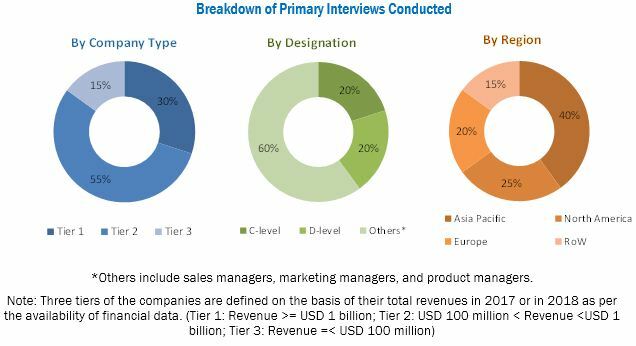 The research methodology includes the study of annual and financial reports of top market players as well as interviews with industry experts (such as CEOs, VPs, directors, and marketing executives) for key insights (both quantitative and qualitative) for the molecular breeding market. The various contributors involved in the value chain of the molecular breeding market include R&D institutes, breeding entities, technology providers, such as Eurofins (Luxembourg), Illumina (US), Thermo Fisher Scientific (US), SGS (Switzerland), and LGC Limited (UK), and government bodies & regulatory associations such as the US Department of Agriculture (USDA), Canadian Association of Genetic Counsellors (CAGC), and the American Genetic Association (AGA). This research report categorizes the molecular breeding market based on process, marker type, application, and region. 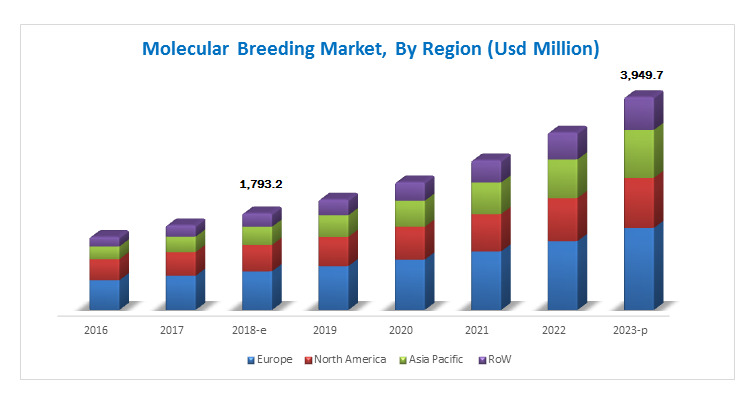 The molecular breeding market is estimated at USD 1.79 billion in 2018 and is projected to reach USD 3.95 billion by 2023, at a CAGR of 17.11% during the forecast period. The agricultural benefits associated with these adjuvant solutions are the major factors contributing to the growth of this market, globally. The growth of economies in developing countries, coupled with the increasing R&D expenses in the agriculture industry drives the growth potential of these markets. Molecular breeding technologies are in the nascent stage of growth in the plant and livestock breeding industry, where major seed manufacturing companies have been adopting this technology for improved seeds. Strong funds by the private and public sectors towards agrigenomic research such as the application of MAS, and genomic selection in field and vegetable crops is projected to drive the growth of the market over the next five years. Also, the decline of prices observed in the genetic services industry in agriculture has encouraged key players to invest in the market. Marker-assisted selection was estimated to dominate the molecular breeding market in 2018. The US was the major country with higher adoption of MAS in 2018. The Netherlands and the UK witnessed 100% adoption of molecular breeding techniques for new development of crop varieties. The adoption of genomic selection is projected to grow at the highest rate, owing to the increasing awareness about its efficacy in increasing yield, majorly for vegetables in developed countries. Multiple breakthrough innovations led to the development of better and efficient DNA or molecular markers such as SNPs and SSRs. Companies such as Eurofins and Thermo Fisher have been offering molecular breeding services such as MAS and genomic selection based on SNPs and SSRs, while some companies such as Illumina Inc. LGC Limited, LemnaTec, and Charles River are dependent solely on SNPs as molecular markers. North America accounted for the largest share in the molecular breeding market in 2017, followed by Europe, owing to the high adoption of advanced genetic tools to increase agricultural yield in countries such as Germany, France, the US, and Canada. Rising cultivation of industrial & high-value crops and growing awareness among farmers about the benefits of molecular breeding are expected to provide more scope for market expansion. The major factors restraining the growth of this market are the high start-up cost associated with the application of molecular markers and automated equipment. Also, the dearth of skilled professionals and lack of infrastructural facilities in developing countries hinder the growth potential of this market. The global market for molecular breeding is dominated by key players such as Eurofins (Luxembourg), Illumina (US), LGC Limited (UK), Thermo Fisher Scientific (US), and SGS (Switzerland). Some emerging players in the molecular breeding market include DanBred (Denmark), Intertek Group (UK), LemnaTec (Germany), Charles River (US), Slipstream Automation (New Zealand), and Fruitbreedomics (consortium).